This Colorado weather sure turned to fall rather quickly. It’s definitely soup season for our family when the temperatures dip into the 50’s or lower. 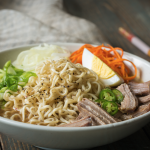 This Pork Ramen Bowl is a delicious soup/bowl recipe that comes together quickly with roast shredded pork, flavorful beef broth infused with garlic and ginger and served with shredded carrots, sliced scallions, and sliced onions. I served with fresh sliced jalapeno and Sriracha for a little more heat, but you can omit that and enjoy the bowl as is. Skip the ramen noodle packet and avoid the excess sodium in the dish. Simply enjoy the texture from the ramen noodles. You could also use udon or soba noodles in this dish if you prefer. 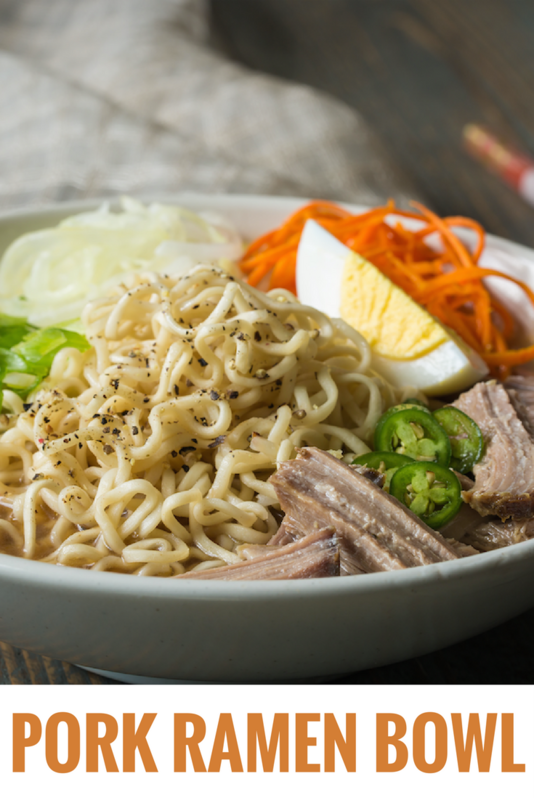 Take advantage of the hot sales on pork shoulder, beef broth, ramen noodles and carrots at Safeway to make this delicious, budget friendly meal that will warm you up on these cool fall nights! Save some for lunch the next day as well. See more meal ideas based on sales in our From the Kitchen page. Tender roasted pork in a flavorful beef broth with ramen noodles, served with shredded carrots, onions, and ginger. Easy, delicious meal to use up roasted, shredded pork. Heat a 2 quart sauce pan over medium-high heat Spray with nonstick cooking spray. Add carrot, onion, salt and pepper. Sauté for 3 minutes, adding garlic and ginger the last 30 seconds. Add broth and bring to a boil. Add noodles and cook for 3-4 minutes. Add shredded pork and serve. 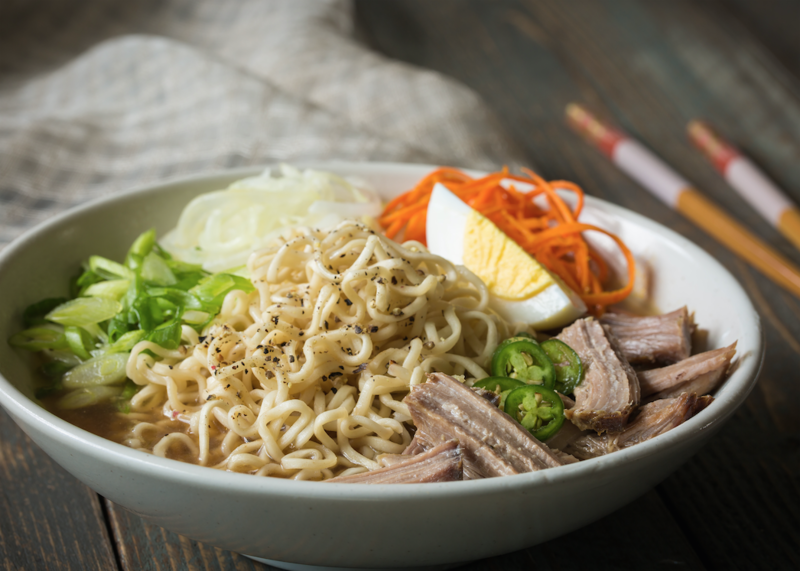 Check out this great recipe below from our friends at Safeway for Ginger Garlic Roasted Pork that you can use to prepare the pork for the Pork Ramen Bowl.